Editor's note: An earlier version of this story misstated the change in fiscal second-quarter revenue, and the reasons for Subaru's lower profits in the fiscal second quarter and the company's reduced earnings outlook. 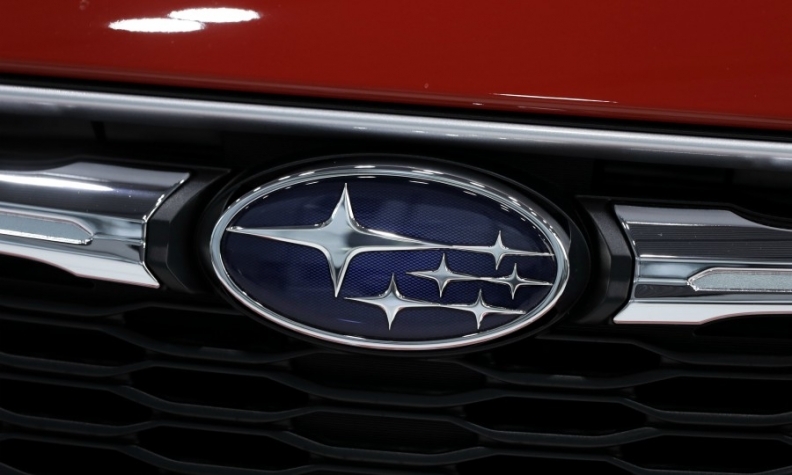 TOKYO -- Subaru profits tumbled in the latest quarter on lower wholesale shipments, rising U.S. incentives and a one-time charge related to the bankruptcy of airbag maker Takata. The Japanese automaker cut its full fiscal year profit and sales outlook as a result. North America, which accounts for nearly 70 per cent of Subaru's global sales, dented Subaru performance in the latest quarter. Subaru's U.S. sales are up 6.4 percent this year through October, though growth has slowed in recent months. Sales in Canada climbed 9.1 per cent. Operating income declined 13 per cent to 92.8 billion yen (US$824.7 million) in Subaru’s fiscal second quarter ended Sept. 30, the carmaker said on Monday, while announcing results. Net income cratered 97 per cent to 2.7 billion yen (US$24 million) in the period. Revenue rose three per cent to 831.5 billion yen ($7.39 billion) in the July-September period despite a 2.6 percent slide in worldwide wholesale deliveries, to 259,900 vehicles. Automakers book revenue when vehicles are shipped to dealers and fleet operators. Subaru said North American wholesale shipments slid from 184,900 to 174,600 during the quarter. U.S. wholesale volume also fell. Automakers book revenue when vehicles are shipped to dealers and fleet operators. Operating profits were hit by higher incentives and warranty outlays, higher costs for raw materials and increased investment in U.S. factories and r&d, Subaru said. Net income was hammered by a special loss for recall costs Subaru won’t be able to recover after calling back vehicles equipped with airbag inflators made by Japanese supplier Takata. Takata went bankrupt earlier this year after defective airbag inflators were linked to at least 18 deaths worldwide and triggered history’s biggest automotive recall. Subaru warned in August it would be unable to claim compensation against the supplier and said it would book a special loss of 81.3 billion yen (US$722.5 million) in the fiscal second quarter. Citing falling sales and the Takata charge, Subaru trimmed its full-year outlooks. Global sales are now forecast to expand just 0.3 per cent to 1.07 million vehicles, in the current fiscal year ending March 31, 2018. The carmaker had earlier expected global volume to grow 3.9 per cent to 1.12 million vehicles in the current fiscal year. U.S. volume should be flat at 668,000 units in the fiscal year, compared with 667,000 vehicles the year before. Subaru had earlier forecast sales would increase three per cent to 687,700 units. Subaru also expects a steeper, 27 per cent drop in full-year net income to 207 billion yen (US$1.84 billion) in the current fiscal year ending March 31, 2018. It had earlier forecast net income would decline only 7.3 per cent to 228.5 billion yen (US$2.03 billion). Further depressing full-year net income will be outlays related to improper vehicle inspections in Japan. Subaru admitted last month that reveal uncertified workers have conducted vehicle inspections at Japanese assembly plants in violation of guidelines. It was the second automaker, after Nissan Motor, to become embroiled in a backlash about improper inspections of vehicles sold in the domestic market. Subaru is evaluating what vehicles might need to be recalled for re-inspection. It said dealing with the problem will cost an extra 10 billion yen (US$88.9 million) in the fiscal year. In the fiscal first half, regional operating profit in North America fell 13 per cent to 43.9 billion yen (US$390.1 million). Japan remained the earnings anchor, with regional operating profit in the home market advancing 20 per cent to 158.6 billion yen (US$1.41 billion). Rising incentives undercut profits. Average U.S. outlays rose to around $1,800 per vehicle in the latest quarter from $1,600 per vehicle a year earlier, CFO Toshiaki Okada said. That lopped 21.4 billion yen (US$190.2 million) off operating profit, Okada said. Falling U.S. demand for sedans, including the Subaru Legacy, hurt volume. Meanwhile, competition is heating up in Subaru's mainstay crossover segment as other brands rush into the arena with rival offerings. Still, executives said Subaru's spiffs are still lower than those of competitors and promised to restrain incentive growth. U.S. sales should pick up again next year after Subaru introduces its large-size crossover, the Ascent, President Yasuyuki Yoshinaga said. The new nameplate is expected to reach customers in a segment where Subaru currently doesn't compete. "We will roll out the Ascent next year, so we can boost sales further," Yoshinaga said. "We will not ramp up incentives in order to increase sales volume." Regional operating profit in other regions fell in the fiscal first half.